Seasoned diabetics must know this well, and I did in theory from reading the JDRF information book I was given on day one, but getting a cold affects blood glucose control. In my case I was merrily going about my business taking my usual dose of insulin (about one unit per 50g of carbs that I eat), when my glucose control started to go mental. I was getting very high readings on a very regular basis. Had I suddenly ceased to be in the honey moon phase? 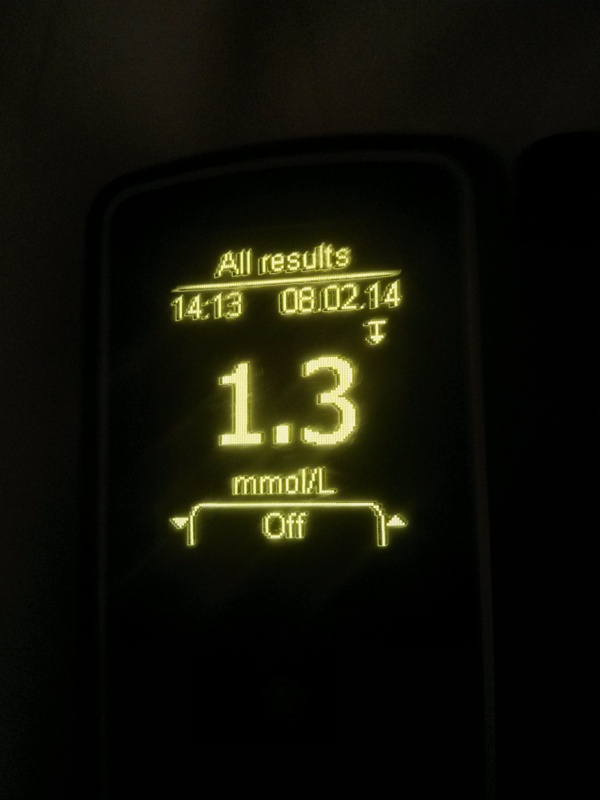 Was I now a proper, full-on type 1 diabetic? Will my glucose control strategy whilst running have to totally change? Was I going to go blind because I couldn’t control my blood sugar? I’m really lucky, because I have never got upset or frustrated with diabetes. This time was no different – I was surprised to find myself actually enjoying the challenge of coping with the condition. 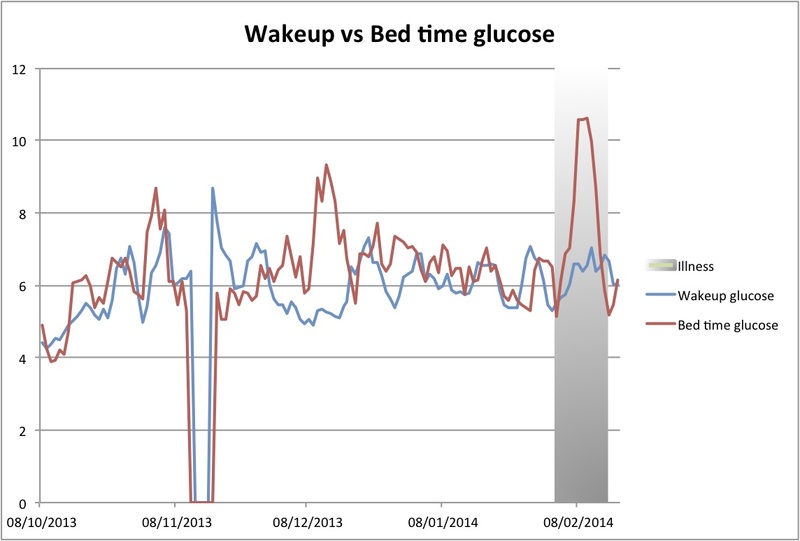 After wondering what was going on for a couple of days, I remembered that being ill affects glucose control. When the body is ill, the liver releases more glucose into the blood, according to the Diabetes UK website. So as a diabetic one needs to take more insulin. I gradually increased my insulin doses – I didn’t want to overdo it and give myself a massive hypo – until I had my blood sugar under control. This meant that I ended up more than doubling my insulin dose (from one unit for 50-60g of carbs to one unit for 20g very briefly). This worked, and I’m now back up to about one unit to 40g of carbs. 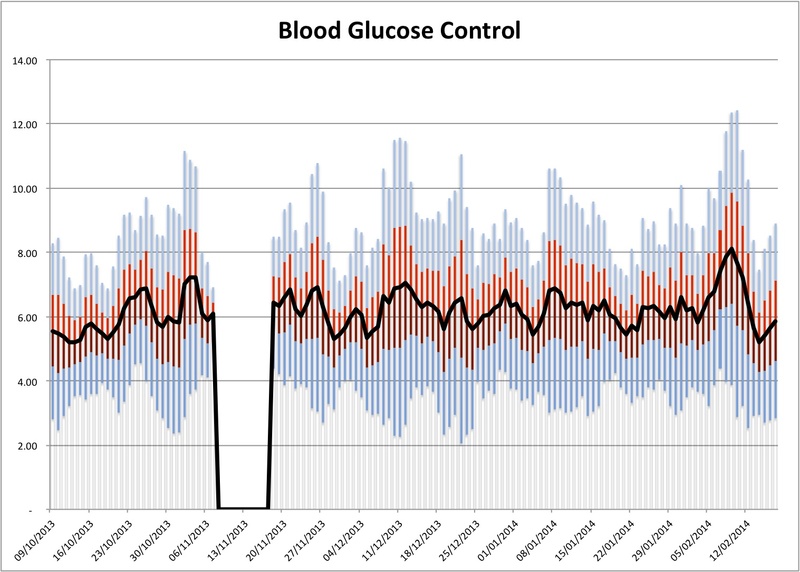 So maybe that means I’m getting better… The chart below shows a history of my blood sugar control. 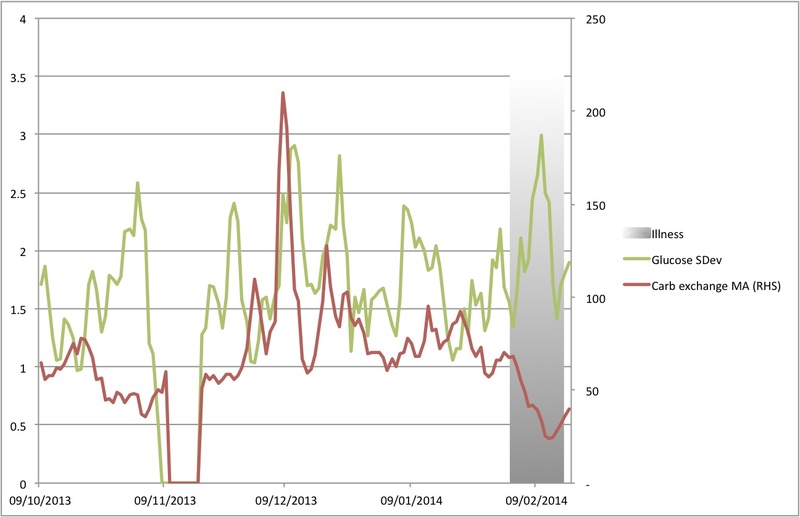 Any guesses about when I got a cold? That’s right: when average blood sugar levels went much higher. Average daily blood glucose (black line) got a lot higher, and the range of daily readings got much wider whilst I was ill. I aim to keep it between 4 and 8. Click on the chart to enlarge. The next chart shows how variable my blood sugar was during my illness. It also shows how much I had to change my insulin dosage. This chart is really geeky. To see whether my blood glucose was more variable while I was ill (grey patch) I calculated the standard deviation of daily blood readings. Basically if readings become more erratic the standard deviation goes up. You can see that the green line – standard deviation – did go up while I was ill. As I started to get blood glucose under control, by taking a lot more insulin (red line), my blood glucose readings became less erratic, and the green line came down. One of the most uncomfortable things about increasing my dosages of insulin so drastically whilst ill was taking what felt like huge doses of insulin before my evening meal, which is often very late in the evening and just before I got to bed. Would I get a bad hypo whilst sleeping? Luckily, one of the advantages about being so exact with all this data I’m generating is that I actually have a much better chance of getting glucose control right compared to if I was doing it “blind”. I didn’t have any night time hypos. Interestingly, despite my blood sugar being all over the place during the day, even when I was ill, I was waking up with good levels. Probably because I’m still in the honey moon phase which is why I’m hoping that one day treatments like the monopeptide trial I’m participating in will allow newly diagnosed patients to remain in the honey moon phase perpetually. Another advantage of analysing all my data so carefully is that I have the confidence to change my regime if I think it’s the right thing to do. So my golden rule of not taking any insulin before or during skiing (only in the evening) was broken recently when I was skiing. I was much less sensitive to insulin than normal, so could take it before skiing. I had a fantastic and frustrating weekend all in one a week ago. There was loads of powder around to ski, and very few lifts open to ski it. We solved the problem on one day by walking from the bottom of the ski resort to the top – twice! (Good training for the marathon.) The lift queues were actually so bad that on my second lap, I think I got up as quickly as Emily, who opted for the lift! I don’t have any control over the weather, so can get annoyed when it conspires to rob me of a day’s skiing. Diabetes on the other hand is down to me to control so I don’t get frustrated with it (yet). Ask me if I feel the same way when I’m out of the honey moon phase. 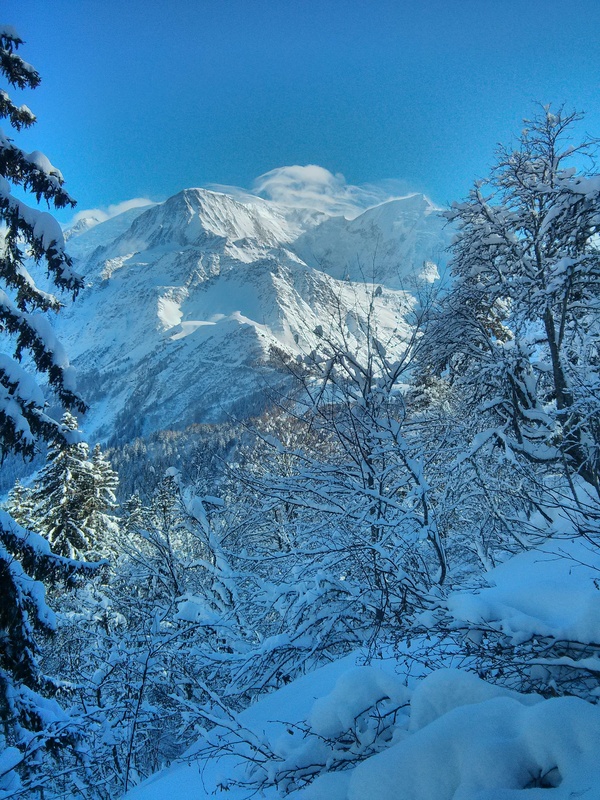 Chamonix isn’t really that busy is it? 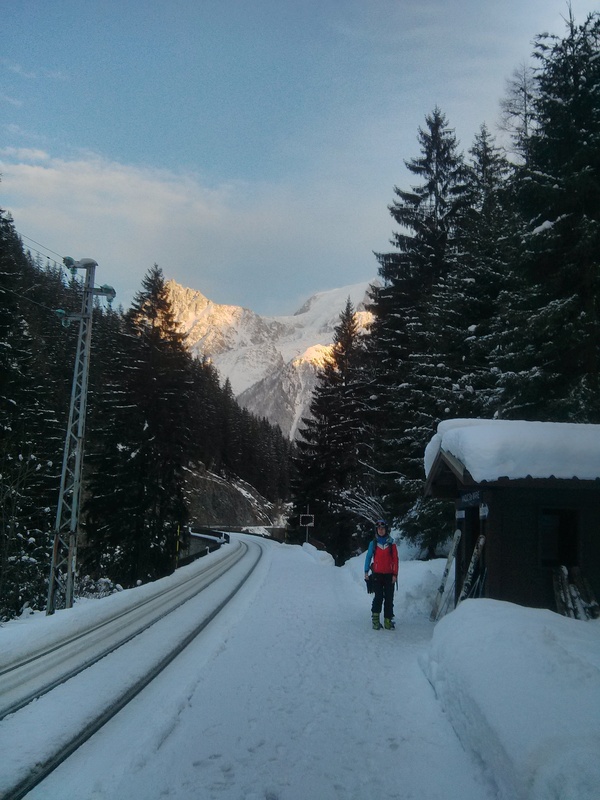 After a days skiing – well more walking uphill than skiing – we opted to ski a kind of crazy cat track down to the train station. No-one else did, so we could enjoy the sunset by ourselves whilst everyone else crowded like a sardine into the bus. When is a hypo not a hypo? At the top of the Grands Montets cable car, I tested my blood and found it to be 1.3!!! That is a really bad hypo. The thing is, I felt totally fine. I have been told that the glucose monitor works at altitude. So I had the choice to believe my own senses or the monitor. I ate four jelly babies and skied off. On testing myself 20 minutes later, I was back up to around 8. If I was 1.3, that’s really worrying. But I’m just not sure I believe it. I still feel low blood sugar when I drop below 4.3 or 4.4 so I should definitely have felt it at 1.3! Maybe my glucose monitor didn’t work. Maybe gaining altitude rapidly (like on a cable car) causes blood glucose readings to go wrong (the reading was fine at a similar altitude 20 minutes later). Maybe the fact that all the exercise I do means that my liver is used to routinely releasing glucose into my body and I can handle bad hypos? (That’s what Roger Hanney thinks and his diabetes hasn’t stopped him achieving incredible things.) Who knows? Neither Roger or I are doctors. I’m going to ask my doctor, and carry on being super cautious about hypos up a mountain. Oh. My. God. Am I about to die?!?! Luckily I felt fine and just munched some magic jelly babies. Beautiful photos. I think it’s really great how active you are despite being newly diagnosed!! Being sick is always the worst with diabetes. My blood sugars have a mind of their own when I am sick. Also, some medications really cause my sugar to spike DESPITE my doctor telling me they shouldn’t change my numbers at all. I guess my body reacts strangely to certain types of allergy medication!! Good luck and I can’t wait to read about more of your marathon training!